Ornamental turning is many-faceted branch of turning which uses specialized lathes and cutting tools. There are a number of highly specialized forms of lathe work commonly grouped together under the name of ornamental turning, or OT for short. Historically it has been known as “complex” or “eccentric” turning, only to distinguish it from “plain” turning which can be accomplished between centers. At the risk of greatly over-simplifying it, the two main areas of ornamental turning are generally referred to as “indexed work” and “engine turning”. Indexed work is typically done by rotating the headstock of the lathe to an indexed position, making a precise cut, then moving the headstock to the next indexed location and repeating the process. Indexed-type of ornamental turning can be done on almost any lathe—you may be turning on a lathe that has this capability today. All that is required is a division plate of some sort, a slide rest to manipulate the tool accurately, and a rotary cutter of some type. Engine turning by contrast, produces characteristic “wave” patterns on the work by mechanically moving the work or the tool. Most people will be familiar with engine turning in the form of the ornate geometric metal engravings found on old watch cases. Engine turning encompasses rose engine work. A rose engine differs from other lathes in many ways, but the biggest difference is that the head- stock is not stationary. The headstock is hinged, allowing it to pivot back and forth, called rocking. By controlling this rocking motion with a rosette—a cam-like disk—you can cut countless patterns. Rose engine turning has been seen in examples of work dating back to the early 1600’s. Early work was carried out as decoration on drinking vessels, typically made of lignum vitae. It is as assumed that this style of work became known as rose engine turning due to the similarity of shapes in that early work to the petals of a rose. Although ornamental turning has been around for centuries, Generally speaking, its popularity peaked in the Victorian era prior to the introduction of the automobile. It was during this heyday that the rotary cutting devices or fly cutters were popularized, largely replacing many of the pro filed drilling tools and fixed cutting tools that had been the historical mainstay. Rare and obscure in the wood turning world, few rose engines were ever produced. Today, the number of existing antique rose engines designed for wood turning can probably be counted on two hands, and many of those are in museum collections. A few modern rose engine lathes exist, but as the rose engine lathe can be a complex machine, they are typically rare and expensive. 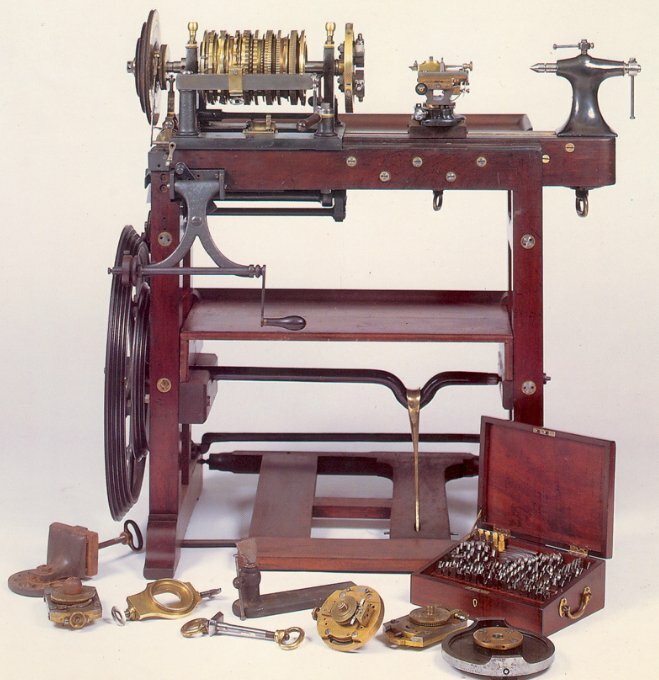 The Holtzapffel lathe above is typical of the rare Victorian-era rose engines produced. Contrary to their modest reception in wood turning, the rose engine did find its niche in the jewelry and watchmaking world. An abundance of work was produced on industry-specific rose engines known as “round engines” or “rotary engines”. The round engine term was ostensibly used to differentiate the rotating lathes from their counterpart “straightline engines”. Straight-line engines also cut characteristic wave patterns in metal, but they do so off of a “pattern bar” which has bumps, similar to those on a rosette, but on a flat, straight piece of metal. Engine turning by either technique on metal produces characteristic wave patterns on the work by mechanically moving the work past a fixed cutter. Round and straightline engines created the ornate and geometric patterns found on old watch cases, cigarette cases, lighters and fine pens. Engine turning is also recognizable, under the enamel, in pieces like the world renowned Fabergé eggs. Today many ornamental turners resort to modifying machines designed and built for the watch and jewelry industry which were produced into the 1950’s. Notice the differences between the rosettes characteristic of a wood turning rose engine on the left, and the more subdued and higher-count patterns of those on a typical metal working rose engine on the right. In contrast to plain turning, the workpiece in ornamental turning is typically either fixed or rotating slowly (generally under 10 rpm). In ornamental turning, the tool is usually moving, in the form of either a fly cutter or a drilling-spindle, revolving at speeds similar to a router bit. Profiled cutters are often employed. For some types of work, a fixed tool is used that merely scratches the surface, to a precisely controlled depth, which is the technique employed in most metal working techniques like watchmaking. Regardless of the machines used, most contemporary ornamental turning is decoration applied to partially hand-turned work, resulting in a combination of hand turning and ornamental work. The ornamentation is just that—additional decoration added to a piece of work. In contrast, much of the OT work from the Victorian-era had ornamentation covering every possible surface.